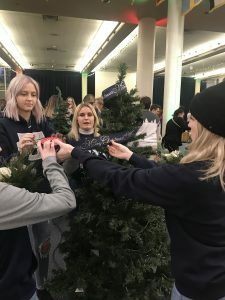 A number of families in Cache Valley will receive a freshly cut and decorated Christmas tree thanks to some Utah State University students. 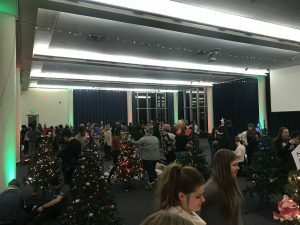 The annual Festival of Trees event is being held the week of December 3rd-7th on the campus of Utah State. Students from different organizations and clubs are donating their time and talents by decorating individual trees. When finished, the trees will be transported to Bear River Head Start, a community outreach organization, then given to families in Cache County who may be struggling this holiday season. “We had 12 of the sports teams at the University come and decorate their own trees,” according to USUSA Traditions Organizer, Lexie Jex. She said they reach out to all the clubs and try to get as many people involved as possible. Jex said this a great opportunity to lighten the mood for students before finals and it’s a great way for the different organizations to reach USU Students. Once the trees are decorated, students will vote for their favorite one and prizes are awarded at the end of the week. A total of 50 trees will be donated during this year’s Festival of Trees event.